The Manic Street Preachers are coming home to a South Wales sell-out concert tomorrow with a hit under their belts. For all those who thought the Manic Street Preachers were last year's hype, now they're this year's sell-outs - at least as far as their British tour goes. 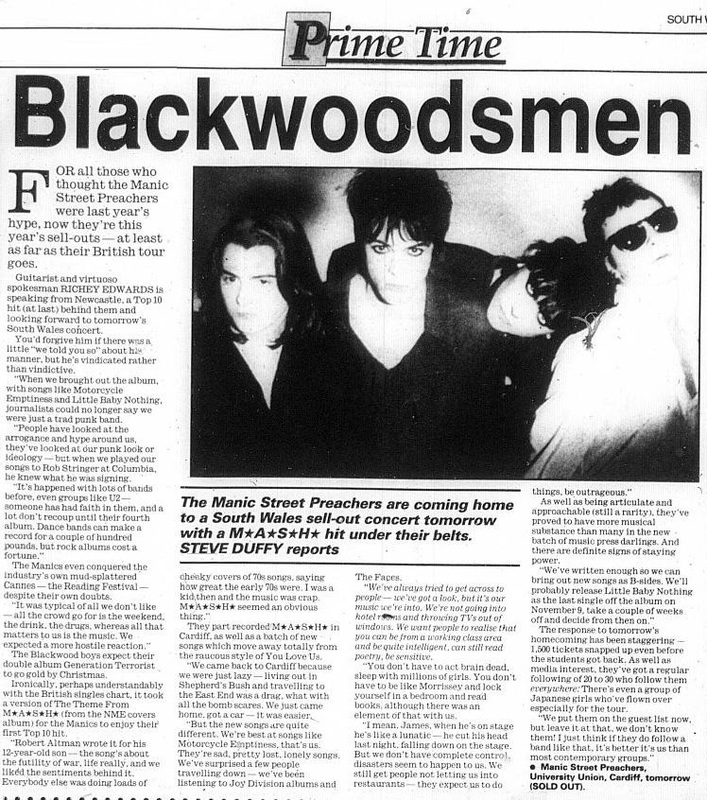 Guitarist and virtuoso spokesman Richey Edwards is speaking from Newcastle, a Top 10 hit (at last) behind them and looking forward to tomorrow's South Wales concert. You'd forgive him if there was a little "We told you so" about his manner, but he's vindicated rather than vindictive. "When we brought out the album, with songs like Motorcycle Emptiness and Little Baby Nothing, journalists could no longer say we were just a trad punk band." "People have looked at the arrogance and hype around us, they've looked at our punk look or ideology - bet when we played our songs to Rob Stringer at Columbia, he knew what he was signing." "It's happened with lots of bands before, even groups like U2 - someone has had faith in them, and a lot don't recoup until their fourth album. Dance bands can make a record for a couple of hundred pounds, but rock albums cost a fortune." The Manics even conquered the industry's own mud-splattered Cannes - the Reading Festival - despite their own doubts. "It was typical of all we don't like - all the crowd go for is the weekend, the drink, the drugs, whereas all that matters to us is the music. We expected a more hostile reaction." The Blackwood boys expect their double album Generation Terrorists to go gold by Christmas. Ironically, perhaps understandably with the British singles chart, it took a version of The Theme From M*A*S*H (from the NME covers album) for the Manics to enjoy their first Top 10 hit. "Robert Altman wrote it for his 12 year-old-son - the song's about the futility of war, life really, and we liked the sentiment behind it. Everybody else was doing loads of cheeky covers of '70s songs, saying how great the early '70s were. I was a kid then and the music was crap. M*A*S*H seemed an obvious choice. They part recorded M*A*S*H in Cardiff, as well as a batch of new songs which move away totally from the raucous style of You Love Us. "We came back to Cardiff because we were just lazy - living out in Shepherd's Bush and travelling to the East End was a drag, what with all the bomb scares. We just came home, got a car - it was easier." But the new songs are quite different. We're best at songs like Motorcycle Emptiness, that's us. They're sad, pretty lost, lonely songs. We've surprised a few people travelling down - we've been listening to Joy Division albums and The Faces." "We've always tried to get across to people - we've got a look, but it's our music we're into. We're not going into hotel rooms and throwing TVs out of the windows. We want people to realise that you can be from a working class area and be quite intelligent, can still read poetry, be sensitive." "You don't have to act brain dead, sleep with millions of girls. You don't have to be like Morrissey and lock yourself in a bedroom and read books, although there was an element of that with us." "I mean, James, when he's on stage he's like a lunatic - he cut his head last night, falling down on the stage. But we don't have complete control, disasters seem to happen to us. We still get people not letting us into restaurants - they expect us to do things, be outrageous." As well as being articulate and approachable (still a rarity) they've proved to have more musical substance than many in the new batch of music press darlings. And there are definite signs of staying power. "We've written enough so we can bring out new songs as B-sides. We'll probably release Little Baby Nothing as the last single off the album on November 9, take a couple of weeks off and decide from then on." The response to tomorrow's homecoming has been staggering - 1,500 tickets snapped up even before the students got back. As well as media interest, they've got a regular following of 20 to 30 who follow them everywhere:There's even a group of Japanese girls who've flown over especially for the tour. "We put them on the guest list now, but leave it at that, we don't know them! I just think if they do follow a band like that, it's better it's us than most contemporary groups." This page was last modified on 26 March 2018, at 17:11.